Permet aux artistes numériques d' utiliser et de construire leurs propres filtres. L'offre gratuite du jour pour Filter Forge 5.0 Pro était valable le 27 mars 2017! Filter Forge est un programme permettant aux artistes numériques d'utiliser et construire leurs propres filtres - textures homogènes, effets visuels, des distorsions, des motifs, milieux, cadres, et plus encore. Les principales caractéristiques de Forge filter comprennent un éditeur de filtre visuel et une bibliothèque en ligne gratuite de plus de 11.000 filtres créés par l'utilisateur à laquelle chacun peut contribuer. Il fonctionne comme une application autonome ou comme plug-in sous un certain nombre d'ordinateurs. We had ver 4 more than a year ago and it's amazing, do one needs to uninstall 4 before installing 5? current version is 6, but what the difference 4 vs 5 vs 6? Download and installation went without a hitch. Easy Peasy. Trying to get a licence key? Not so much. Go to the page...enter ALL my details hit "Send" and...nothing. All the details are still there, nothing to say I have missed anything in the form. It appears to cycle, but then it goes nowhere. Haven't received an email with any key so have no idea if it has actually done...anything. Download and installation went without a hitch. Easy Peasy. Trying to get a licence key? Not so much. Go to the page...enter ALL my details hit "Send" and...nothing. All the details are still there, nothing to say I have missed anything in the form. It appears to cycle, but then it goes nowhere. Haven't received an email with any key so have no idea if it has actually done...anything. Also it seems impossible to create an account (not a necessity, but I thought it would be useful). Again do all that is asked and hit "Register"..and...nothing happens. Bit of a pain... Site problems? After reading the features webpage I don't understand the utility of a filter or this software. It sounds like I can use it to create filters which look like a background designs to me. But I don't understand how I might use the filters or what other graphics software or other program I might need to take advantage of them. Perhaps someone can enlighten me. Jim M, You can use Filter Forge easily without ever creating your own filters, if that is what you want to do. 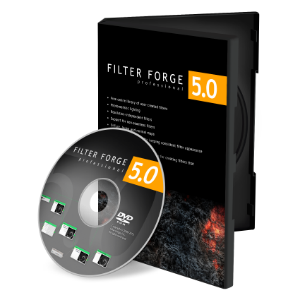 The Filter Forge website has many, many filters that you can download and use for free. While many of them will function as textures or backgrounds, there are also filters that will improve your photos, e.g., make your photos sharper, change the saturation, enhance lighting, etc. There are also filters for special effects, e.g., add a silver or gold effect, emboss, vignettes, etc. - Jane, does this mean that in the event of a computer crash or switch you will send us GOTD users another installer of this version? Hopefully, it is still the case. Filter Forge 4 giveaway last april: https://www.giveawayoftheday.com/filter-forge-4015/ Note the dialog I had with the FF people then: - Jane, does this mean that in the event of a computer crash or switch you will send us GOTD users another installer of this version? - ouialaraison, yes, sure. Hopefully, it is still the case.